On November 30th and December 1st, 2010, “The World Technology Summit & Awards 2010″ was convened at the TIME Conference Center in New York City. “The World Technology Summit & Awards 2010″ are presented by World Technology Network in association with TIME, FORTUNE, CNN, Science etc. to celebrate individuals and corporations achieving significant, lasting progress in categories pertaining to science, technology, the arts, and design. Previous Japanese winners of “The World Technology Awards” are Mr. Masayoshi Son (Finance, president of Softbank Co., 2000), Dr. Shuji Nakamura (IT Hardware, inventor of Blue-ray semiconductor, 2002), Mr.Issey Miyake (Designer, 2003). Prof. Yabe missed to be a winner, however, he becomes one of WTN fellows with this achievement. The winner of energy category (individual) is Mr. JB Straubel, CTO of Tesla Motors. Colloquy between Prof. Yabe and Mr. Takeshi Kitano in "Shincho45"
Toshio Okada's Twitter ReadShow talked about "The Magnesium Civilization"
SAITEC technical lecture "Challenge for avoidance of rare-metal crisis"
Prof. Takashi Yabe was chosen to be one of the 5 finalists for energy category of "The World Technology Summit & Awards 2010"
Prof. Takashi Yabe nominates for "The World Technology Summit & Awards 2010"
iPhone app "The Magnesium Civilization"(Japanese Edition) is now on sale! 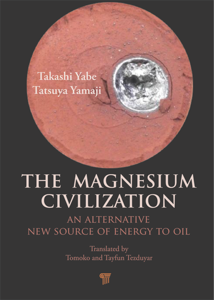 TSC and SAITEC developed "Magnesium battery"
On March 16th, Business Front Line (NHK BS1) broadcasts "Possibility of magnesium fuel"
On March 8th, NHK WORLD broadcasted "Magnesium energy cycle"
On February 8th, WBS's special topic is "Magnesium"